Inspired by Paris’ Nuit Blanche and the international network of White Night programmes around the world, White Night Melbourne, Australia’s most celebrated cultural event returned for one night only on Saturday 21 February 2015. Last year we went there in the evening and were literally stuck on Swanston Street, as it was VERY crowded (don’t even ask me how we got home on that day). However, this year we were prepared and went to the White Night right after a midnight. 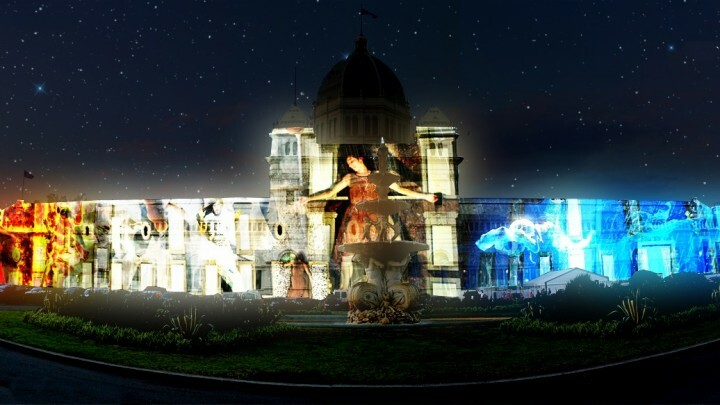 It was a smart decision, as we were able to experience the visual art, spectacular illuminations, music, theatre, special dining experiences, film, design and performances on display in venues without any problems. That night the weather was perfect: no rain, no winds, quite warm (some say it was hot) - ideal for long walk with your friends or your loved one. I took my tripod and took as much photos I could of every visual art that was in my agenda. Oh, yes, the agenda. Before going to the event I prepared it based on information from the official website. The website itself is still has some parts to work on (e.g. I would love to have a feature like sending an url to the map with selected items as a link), but hey, it is just a third event, not the 20th ;) We printed maps, reviewed our list and at 1am were near Royal Exhibition Building, where 4 ELEMENTS by OCUBO were presented. The next one SOFLES – GRAFFITI MAPPED presented by JUDDY ROLLER. It was not in our list, as it was somewhere in a ‘secret’ place (in fact it was near the Melbourne Gaol), so we were quite impressed with the a pioneering interactive mural project that explored the interconnected nature of street art, technology and the online frontier. Next one was the State Library of Victoria (“Rabbit Hole” and “Eat Me”). In celebration of the sesquicentenary of the publication of Lewis Carroll’s ‘Alice’s Adventures in Wonderland’, and referencing the State Library’s own ‘Alice’ collection, projection artist Nick Azidis transformed the exterior of the State Library of Victoria into the beginnings of our Alice in Wonderland adventure. There were lots of people waiting in a queue to see ‘Eat me’ performance inside the library, but we decided not join them and proceed further. KEYFRAMES installation was the next. It is an installation of luminous plastic bodies which invaded and transformed the front of the National Gallery of Victoria. Based on the principles of kinetics and the break-up of movement into component parts, KEYFRAMES uses programmed lighting sequences to create a bridge between sculpture and movies. To give you an idea how it looked liked see 4 frames below. The bodies transformed all the time and it was quite interesting to see and hear their story. 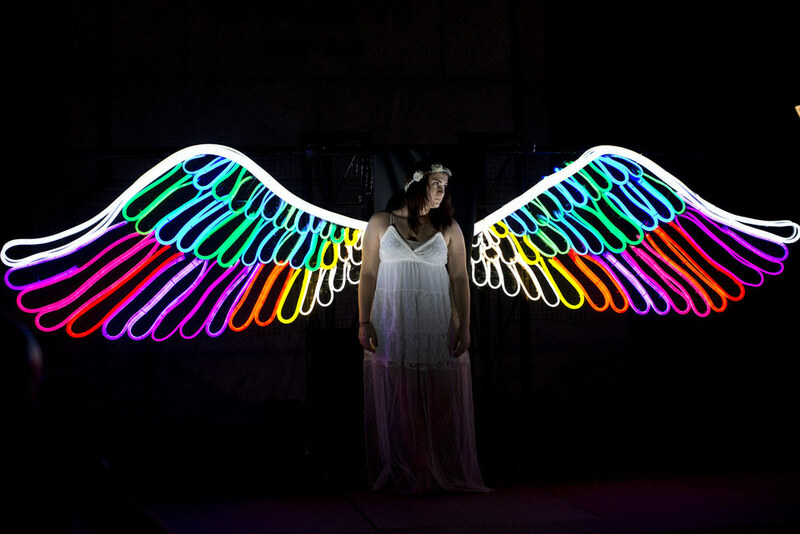 Upon entering Queen Victoria Gardens we could discover a majestic pair of giant multi-coloured Neon Angel Wings which appear to hover, summoning you to stand in front of them and ‘wear’ them for a truly angelic photo. The next one was the CIRCLES OF LIGHT - an immersive, interactive plant installation in the Janet Lady Clarke Rotunda of Queen Victoria Gardens. Viewers were welcomed to touch and experiment with the different interactive plants that transform the space with light and sound. 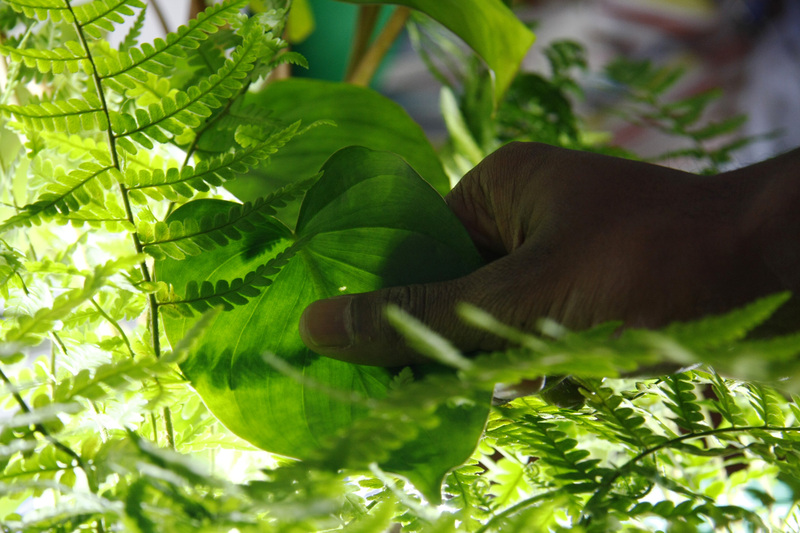 The plants were made interactive by means of an electrical system that senses the presence of touch through changes in capacitance. This system was constantly monitoring these changes in order to control the lighting and sound. We also passed the TOTEM Turtle, the Chorus (a monumental installation of kinetic sound sculptures), had a look at Infinite Curve installation and Nocturnal Bloom - a wall with bricks made of light. Sorry, I didn't take any good photos, but all the works were worth to look at! We crossed Yarra River to get to ACMI and see the Google Cube - a new platform for interactive storytelling, developed by Google’s Creative Lab, which allows filmmakers, musicians, artists and other creatives to make films where the viewer controls the narrative structure. Anyone interested was able to ‘play’ with a real ‘cube’ and create his own story. The next one were the Wonderland projections on the buildings of the Flinders Street. We get back to the ‘cherry’: the banks and depths of the Yarra which were transformed into a Little India, complete with a sublime glowing lotus pond and lined with scenes from bustling Indian streets! There also was a beautiful metal dragon piercing the sky with her flames and a fire garden. THE CRUCIBLE flamed every 10 minutes and it was the last installation that we’ve visited on that night. Wish we could walk longer, but we didn’t sleep that night and were quite tired by that time. We got back home at 5am, exhausted but happy. Next year will try to visit the White Night in the morning to see all the beauty before the sun rises.